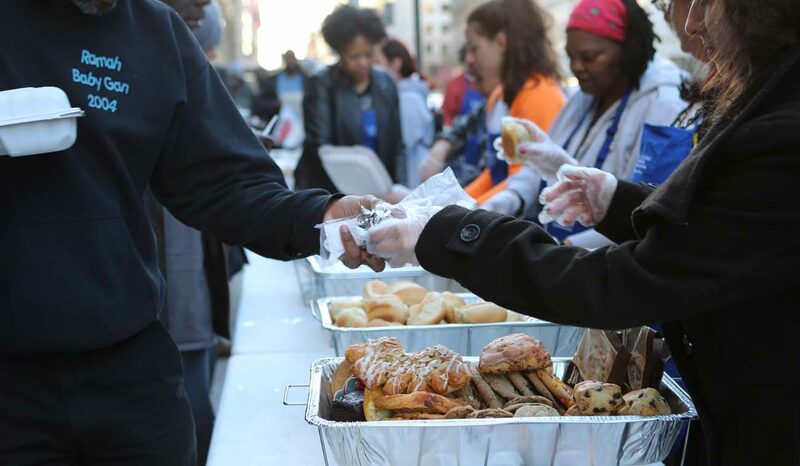 WASHINGTON (CNS) — Almsgiving is a Lenten tradition and Washington resident Ron Van Bellen says his volunteer work feeding the homeless honors his Catholic faith as he prepares for Easter. The real estate agent and parishioner at Holy Trinity Catholic Church in Georgetown was one of several volunteers dishing up dinner for homeless men and women lined up March 8 for the weekly St. Maria’s meals program sponsored by Catholic Charities each Wednesday evening. Van Bellen took time to greet each man and woman who went through the food line before they made their way along the downtown Washington sidewalk to eat their dinner. Van Bellen’s example of helping the homeless during Lent is a Catholic value that Washington’s Catholic Charities president and CEO, Msgr. John Enzler, would like to see spread across the U.S. The homeless are among the world’s most vulnerable people and providing service to them during Lent is an ideal way for Catholics to live out their faith in a way that will make a real difference, he said. Concerted efforts by religious and governmental organizations to address the U.S. homeless situation appear to be making a difference. The U.S. Department of Housing and Urban Development reported a 3 percent drop in the national homeless rate from 2015 to 2016 and a 12 percent drop in the last five years. HUD reported the 2016 national homeless population to be nearly 550,000. However, the homeless rate rose from 2015 to 2016 in the District of Columbia and a few states, including Alabama, California, Colorado, Hawaii, Oklahoma and Washington. With more than a half million people still considered homeless, it’s an issue that all U.S. cities confront and there are varying solutions being employed to raise money necessary to address it in a consequential way, Msgr. Enzler said. In its effort to fund anti-homelessness programs, Los Angeles County placed a proposal called Measure H on its ballot during its March 7 election. If passed, Measure H would raise the sales tax a quarter cent. Ballots were still being counted as of March 16 to determine the outcome of the measure. He believes more people need to serve as navigators, mentors or coaches for individual homeless men and women. He has been encouraging volunteers in his Catholic Charities’ programs to make the homeless their focal point during Lent. Pope Francis has long urged governments and Christians to recognize the dignity of the homeless and help ease their suffering. Homelessness became more complicated in the nation’s capital this Lenten season, since the Martin Luther King Jr. Memorial Library shut down March 4 for a three-year, multimillion-dollar renovation. Many D.C. homeless men and women used that library branch as a day resource center, a place to get out of the elements during the daytime hours, to use the computer lab to look for work and to use the public restrooms, Msgr. Enzler said. That closure inspired him to explore a partnership between the District of Columbia and other charitable groups to fund an official day resource center for the homeless, complete with a meal program, laundry and shower facilities, as well as job counselors, case managers and social workers. It’s an idea that is still percolating with no commitments yet realized, Msgr. Enzler said. It’s also an idea that Able Putu, a 37-year-old homeless Washingtonian who uses a wheelchair, would like to see come to fruition. Putu said the library closure left him without a place to rest, use the lavatory and made him more vulnerable to being robbed during the daytime hours. Van Bellen said he had been one of those people with a negative opinion of the homeless before he started his volunteer work.